The Monarch in the Arabian story had an ointment which, put upon the right eye, enabled him to see through the walls of houses. If the Arabian despot had passed along a narrow street leading into a main thoroughfare of London, one night just before the clock struck twelve, he would have beheld, in a dingy back room of a large building, a very strange sight. 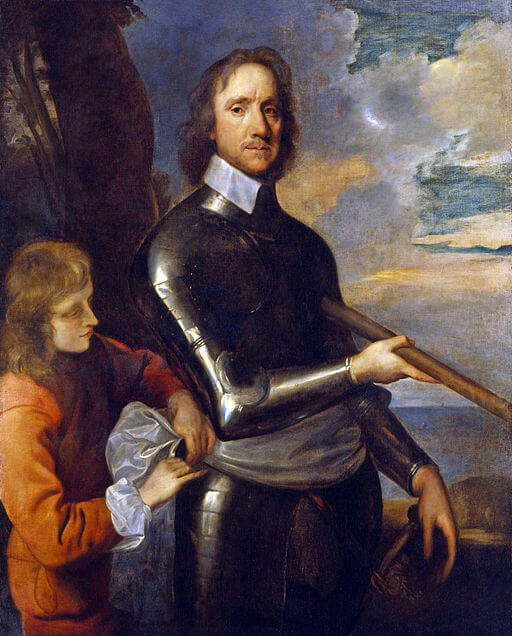 He would have seen King Charles the First seated in friendly converse with none other than Oliver Cromwell. The room in which these two noted people sat had no carpet and but few chairs. A shelf extended along one side of the apartment, and it was covered with mugs containing paint and grease. Brushes were littered about, and a wig lay in a corner. A mirror stood at either end of the shelf, and beside these, flared two gas-jets protected by wire baskets. Hanging from nails driven in the walls were coats, waist-coats, and trousers of more modern cut than the costumes worn by the two men. King Charles, with his pointed beard and his ruffles of lace, leaned picturesquely back in his chair, which rested against the wall. He was smoking a very black brier-root pipe, and perhaps his Majesty enjoyed the weed all the more that there was just above his head, tacked to the wall, a large placard, containing the words, "No smoking allowed in this room, or in any other part of the theatre." Cromwell, in more sober garments, had an even jauntier attitude than the King, for he sat astride the chair, with his chin resting on the back of it, smoking a cigarette in a meerschaum holder. "I'm too old, my boy," said the King, "and too fond of my comfort; besides, I have no longer any ambition. When an actor once realises that he will never be a Charles Kean or a Macready, then come peace and the enjoyment of life. Now, with you it is different: you are, if I may say so in deep affection, young and foolish. Your project is a most hare-brained scheme. You are throwing away all you have already won." "Good gracious!" cried Cromwell, impatiently, "what have I won?" "You have certainly won something," resumed the elder calmly, "when a person of your excitable nature can play so well the sombre, taciturn character of Cromwell. You have mounted several rungs, and the whole ladder lifts itself up before you. You have mastered two or three languages, while I know but one, and that imperfectly. You have studied the foreign drama, while I have not even read all the plays of Shakespeare. I can do a hundred parts conventionally well. You will, some day, do a great part as no other man on earth can act it, and then fame will come to you. Now you propose recklessly to throw all this away and go into the wilds of Africa." "The particular ladder you offer me," said Cromwell, "I have no desire to climb; I am sick of the smell of the footlights and the whole atmosphere of the theatre. I am tired of the unreality of the life we lead. Why not be a hero instead of mimicking one?" "But, my dear boy," said the King, filling his pipe again, "look at the practical side of things. It costs a fortune to fit out an African expedition. Where are you to get the money?" This question sounded more natural from the lips of the King than did the answer from the lips of Cromwell. "There has been too much force and too much expenditure about African travel. I do not intend to cross the Continent with arms and the munitions of war. As you remarked a while ago, I know several European languages, and if you will forgive what sounds like boasting, I may say that I have a gift for picking up tongues. I have money enough to fit myself out with some necessary scientific instruments, and to pay my passage to the coast. Once there, I shall win my way across the Continent through love and not through fear." "You will lose your head," said King Charles; "they don't understand that sort of thing out there, and, besides, the idea is not original. Didn't Livingstone try that tack?" "Yes, but people have forgotten Livingstone and his methods. It is now the explosive bullet and the elephant gun. I intend to learn the language of the different native tribes I meet, and if a chief opposes me and will not allow me to pass through his territory, and if I find I cannot win him over to my side by persuasive talk, then I shall go round." "And what is to be the outcome of it all?" cried Charles. "What is your object?" "Fame, my boy, fame," cried Cromwell, enthusiastically, flinging the chair from under him and pacing the narrow room. "If I can get from coast to coast without taking the life of a single native, won't that be something greater than all the play-acting from now till Doomsday?" "I suppose it will," said the King, gloomily; "but you must remember you are the only friend I have, and I have reached an age when a man does not pick up friends readily." Cromwell stopped in his walk and grasped the King by the hand. "Are you not the only friend I have," he said; "and why can you not abandon this ghastly sham and come with me, as I asked you to at first? How can you hesitate when you think of the glorious freedom of the African forest, and compare it with this cribbed and cabined and confined business we are now at?" The King shook his head slowly, and knocked the ashes from his pipe. He seemed to have some trouble in keeping it alight, probably because of the prohibition on the wall. "As I said before," replied the King, "I am too old. There are no pubs in the African forest where a man can get a glass of beer when he wants it. No, Ormond, African travel is not for me. If you are resolved to go, go and God bless you; I will stay at home and carefully nurse your fame. I shall from time to time drop appetising little paragraphs into the papers about your wanderings, and when you are ready to come back to England, all England will be ready to listen to you. You know how interest is worked up in the theatrical business by judicious puffing in the papers, and I imagine African exploration requires much the same treatment. If it were not for the Press, my boy, you could explore Africa till you were blind and nobody would hear a word about it, so I will be your advance agent and make ready for your home-coming." At this point in the conversation between these two historic characters, the janitor of the theatre put his head into the room and reminded the celebrities that it was very late, whereupon both King and Commoner rose, with some reluctance, and washed themselves; the King becoming, when he put on the ordinary dress of an Englishman, Mr. James Spence, while Cromwell, after a similar transformation, became Mr. Sidney Ormond; and thus, with nothing of Royalty or Dictatorship about them, the two strolled up the narrow street into the main thoroughfare and entered their favourite midnight restaurant, where, over a belated meal, they continued the discussion of the African project, which Spence persisted in looking upon as one of the maddest expeditions that had ever come to his knowledge; but the talk was futile, as most talk is, and within a month from that time Ormond was on the ocean, his face set towards Africa. Another man took Ormond's place at the theatre, and Spence continued to play his part, as the papers said, in his usual acceptable manner. He heard from his friend, in due course, when he landed. Then at intervals came one or two letters showing how he had surmounted the numerous difficulties with which he had to contend. After a long interval came a letter from the interior of Africa, sent to the coast by messenger. Although at the beginning of this letter Ormond said he had but faint hope of reaching his destination, he, nevertheless, gave a very complete account of his wanderings and dealings with the natives, and up to that point his journey seemed to be most satisfactory. He inclosed several photographs, mostly very bad ones, which he had managed to develop and print in the wilderness. One, however, of himself was easily recognisable, and Spence had it copied and enlarged, hanging the framed enlargement in whatever dressing-room fate assigned to him; for Spence never had a long engagement at any one theatre. He was a useful man who could take any part, but had no specialty, and London was full of such. For a long time he heard nothing from his friend, and the newspaper men to whom Spence indefatigably furnished interesting items about the lone explorer, began to look upon Ormond as an African Mrs. Harris, and the paragraphs, to Spence's deep regret, failed to appear. The journalists, who were a flippant lot, used to accost Spence with "Well, Jimmy, how's your African friend?" and the more he tried to convince them, the less they believed in the peace-loving traveller. At last there came a final letter from Africa, a letter that filled the tender, middle-aged heart of Spence with the deepest grief he had ever known. It was written in a shaky hand, and the writer began by saying that he knew neither the date nor his locality. He had been ill and delirious with fever, and was now, at last, in his right mind, but felt the grip of death upon him. The natives had told him that no one ever recovered from the malady he had caught in the swamp, and his own feelings led him to believe that his case was hopeless. The natives had been very kind to him throughout, and his followers had promised to bring his boxes to the coast. The boxes contained the collections he had made, and also his complete journal, which he had written up to the day he became ill.
Ormond begged his friend to hand over his belongings to the Geographical Society, and to arrange for the publication of his journal, if possible. It might secure for him the fame he had died to achieve, or it might not; but, he added, he left the whole conduct of the affair unreservedly to his friend, in whom he had that love and confidence which a man gives to another man but once in his life--when he is young. The tears were in Jimmy's eyes long before he had finished the letter. He turned to another letter he had received by the same mail, and which also bore the South African stamp upon it. Hoping to find some news of his friend he broke the seal, but it was merely an intimation from the steamship company that half-a-dozen boxes remained at the southern terminus of the line addressed to him; but, they said, until they were assured the freight upon them to Southampton would be paid, they would not be forwarded. A week later, the London papers announced in large type, "Mysterious disappearance of an actor." The well-known actor, Mr. James Spence, had left the theatre in which he had been playing the part of Joseph to a great actor's Richelieu, and had not been heard of since. The janitor remembered him leaving that night, for he had not returned his salutation, which was most unusual. His friends had noticed that for a few days previous to his disappearance he had been apparently in deep dejection, and fears were entertained. One journalist said jestingly that probably Jimmy had gone to see what had become of his African friend; but the joke, such as it was, was not favourably received, for when a man is called Jimmy until late in life, it shows that people have an affection for him, and every one who knew Spence was sorry he had disappeared, and hoped that no evil had overtaken him. It was a year after the disappearance that a wan, living skeleton staggered out of the wilderness in Africa, and blindly groped his way to the coast as a man might who had lived long in darkness and found the light too strong for his eyes. He managed to reach a port, and there took steamer homeward bound for Southampton. The sea-breezes revived him somewhat, but it was evident to all the passengers that he had passed through a desperate illness. It was just a toss-up whether he could live until he saw England again. It was impossible to guess at his age, so heavy a hand had disease laid upon him, and he did not seem to care to make acquaintances, but kept much to himself, sitting wrapped up in his chair, gazing with a tired-out look at the green ocean. A young girl frequently sat in a chair near him, ostensibly reading, but more often glancing sympathetically at the wan figure beside her. Many times she seemed about to speak to him, but apparently hesitated to do so, for the man took no notice of his fellow-passengers. At length, however, she mustered up courage to address him, and said: "There is a good story in this magazine: perhaps you would like to read it?" He turned his eyes from the sea and rested them vacantly upon her face for a moment. His dark moustache added to the pallor of his face, but did not conceal the faint smile that came to his lips; he had heard her, but had not understood. "What did you say?" he asked, gently. "I said there was a good story here, entitled 'Author! Author!' and I thought you might like to read it," and the girl blushed very prettily as she said this, for the man looked younger than he had done before he smiled. "I am afraid," said the man, slowly, "that I have forgotten how to read. It is a long time since I have seen a book or a magazine. Won't you tell me the story? I would much rather hear it from you than make an attempt to read it myself in the magazine." "Oh," she cried, breathlessly, "I'm not sure that I could tell it; at any rate, not as well as the author does; but I will read it to you if you like." The story was about a man who had written a play, and who thought, as every playwright thinks, that it was a great addition to the drama, and would bring him fame and fortune. He took this play to a London manager, but heard nothing of it for a long time, and at last it was returned to him. Then, on going to a first night at the theatre to see a new tragedy, which this manager called his own, he was amazed to see his rejected play, with certain changes, produced upon the stage, and when the cry "Author! Author!" arose, he stood up in his place; but illness and privation had done their work, and he died proclaiming himself the author of the play. "Ah," said the man, when the reading was finished, "I cannot tell you how much the story has interested me. I once was an actor myself, and anything pertaining to the stage appeals to me, although it is years since I saw a theatre. It must be hard luck to work for fame and then be cheated out of it, as was the man in the tale; but I suppose it sometimes happens, although, for the honesty of human nature, I hope not very often." "Did you act under your own name, or did you follow the fashion so many of the profession adopt?" asked the girl, evidently interested when he spoke of the theatre. The young man laughed for, perhaps, the first time on the voyage. "Oh," he answered, "I was not at all noted. I acted only in minor parts, and always under my own name, which, doubtless, you have never heard--it is Sidney Ormond." "What!" cried the girl in amazement; "not Sidney Ormond the African traveller?" The young man turned his wan face and large, melancholy eyes upon his questioner. "I am certainly Sidney Ormond, an African traveller, but I don't think I deserve the 'the,' you know. I don't imagine anyone has heard of me through my travelling any more than through my acting." "The Sidney Ormond I mean," she said, "went through Africa without firing a shot; whose book, A Mission of Peace, has been such a success, both in England and America. But, of course, you cannot be he; for I remember that Sidney Ormond is now lecturing in England to tremendous audiences all over the country. The Royal Geographical Society has given him medals or degrees, or something of that sort-- perhaps it was Oxford that gave the degree. I am sorry I haven't his book with me, it would be sure to interest you; but some one on board is almost certain to have it, and I will try to get it for you. I gave mine to a friend in Cape Town. What a funny thing it is that the two names should be exactly the same." "It is very strange," said Ormond gloomily, and his eyes again sought the horizon and he seemed to relapse into his usual melancholy. The girl arose from her seat, saying she would try to find the book, and left him there meditating. When she came back, after the lapse of half an hour or so, she found him sitting just as she had left him, with his sad eyes on the sad sea. The girl had a volume in her hand. "There," she said, "I knew there would be a copy on board, but I am more bewildered than ever; the frontispiece is an exact portrait of you, only you are dressed differently and do not look--" the girl hesitated, "so ill as when you came on board." "You might say with truth, so ill as I look now." "Oh, the voyage has done you good. You seem ever so much better than when you came on board." "Yes, I think that is so," said Ormond, reaching for the volume she held in her hand. He opened it at the frontispiece and gazed long at the picture. The girl sat down beside him and watched his face, glancing from it to the book. "It seems to me," she said at last, "that the coincidence is becoming more and more striking. Have you ever seen that portrait before?" "Yes," said Ormond slowly. "I recognise it as a portrait I took of myself in the interior of Africa which I sent to a dear friend of mine; in fact, the only friend I had in England. I think I wrote him about getting together a book out of the materials I sent him, but I am not sure. I was very ill at the time I wrote him my last letter. I thought I was going to die, and told him so. I feel somewhat bewildered, and don't quite understand it all." "I understand it," cried the girl, her face blazing with indignation. "Your friend is a traitor. He is reaping the reward that should have been yours, and so poses as the African traveller, the real Ormond. You must put a stop to it when you reach England, and expose his treachery to the whole country." "I cannot imagine Jimmy Spence a traitor. If it were only the book, that could be, I think, easily explained, for I sent him all my notes of travel and materials; but I cannot understand him taking the medals or degrees." The girl made a quick gesture of impatience. "Such things," she said, "cannot be explained. You must confront him and expose him." "No," said Ormond, "I shall not confront him. I must think over the matter for a time. I am not quick at thinking, at least just now, in the face of this difficulty. Everything seemed plain and simple before, but if Jimmy Spence has stepped into my shoes, he is welcome to them. Ever since I came out of Africa I seem to have lost all ambition. Nothing appears to be worth while now." "Oh!" cried the girl, "that is because you are in ill-health. You will be yourself again when you reach England. Don't let this trouble you now--there is plenty of time to think it all out before we arrive. I am sorry I spoke about it; but, you see, I was taken by surprise when you mentioned your name." "I am very glad you spoke to me," said Ormond, in a more cheerful voice. "The mere fact that you have talked with me has encouraged me wonderfully. I cannot tell how much this conversation has been to me. I am a lone man, with only one friend in the world--I am afraid I must add now, without even one friend in the world. I am grateful for your interest in me, even though it was only compassion for a wreck--for a derelict, floating about on the sea of life." "Don't you think you could walk the deck for a little?" "I don't know about walking," said Ormond, with a little laugh, "but I'll come with you if you don't mind an encumbrance." He rose somewhat unsteadily, and she took his arm. "You must look upon me as your physician," she said cheerfully, "and I shall insist that my orders are obeyed." "I shall be delighted to be under your charge," said Ormond, "but may I not know my physician's name?" The girl blushed deeply when she realised that she had had such a long conversation with one to whom she had never been introduced. She had regarded him as an invalid, who needed a few words of cheerful encouragement, but as he stood up she saw that he was much younger than his face and appearance had led her to suppose. "My name is Mary Radford," she said. "Miss Mary Radford?" inquired Ormond. That walk on the deck was the first of many, and it soon became evident to Ormond that he was rapidly becoming his old self again. If he had lost a friend in England, he had certainly found another on board ship to whom he was getting more and more attached as time went on. The only point of disagreement between them was in regard to the confronting of Jimmy Spence. Ormond was determined in his resolve not to interfere with Jimmy and his ill-gotten fame. As the voyage was nearing its end, Ormond and Miss Radford stood together leaning over the rail conversing quietly. They had become very great friends indeed. "But if you will not expose this man," said Miss Radford, "what then is your purpose when you land? Are you going back to the stage again?" "I don't think so," replied Ormond. "I shall try to get something to do and live quietly for awhile." "Oh!" cried the girl, "I have no patience with you." "I am sorry for that, Mary," said Ormond, "for, if I can make a living, I intend asking you to be my wife." "Oh!" cried the girl breathlessly, turning her head away. "Do you think I would have any chance?" asked Ormond. "Of making a living?" inquired the girl, after a moment's silence. "No. I am sure of making a living, for I have always done so; therefore answer my question. Mary, do you think I would have any chance?" and he placed his hand softly over hers, which lay on the ship's rail. The girl did not answer, but she did not withdraw her hand; she gazed down at the bright green water with its tinge of foam. "I suppose you know," she said at length, "that you have every chance, and you are merely pretending ignorance to make it easier for me, because I have simply flung myself at your head ever since we began the voyage." "I am not pretending, Mary," he said. "What I feared was that your interest was only that of a nurse in a somewhat backward patient. I was afraid I had your sympathy, but not your love. Perhaps such was the case at first." "Perhaps such was the case--at first, but it is far from being the truth now--Sidney." "There are other people besides ourselves on deck, remember." "I don't believe it," said Ormond, gazing fondly at her. "I can see no one but you. I believe we are floating alone on the ocean together, and that there is no one else in the wide world but our two selves. I thought I went to Africa for fame, but I see I really went to find you. What I sought seems poor compared to what I have found." "Perhaps," said the girl, looking shyly at him, "Fame is waiting as anxiously for you to woo her as--as another person waited. Fame is a shameless hussy, you know." "No. Fame has jilted me once. I won't give her another chance." So those who were twain sailed gently into Southampton Docks, resolved to be one when the gods were willing. Mary Radford's people were there to meet her, and Ormond went up to London alone, beginning his short railway journey with a return of the melancholy that had oppressed him during the first part of his long voyage. He felt once more alone in the world, now that the bright presence of his sweetheart was withdrawn, and he was saddened by the thought that the telegram he had hoped to send to Jimmy Spence, exultingly announcing his arrival, would never be sent. In a newspaper he bought at the station, he saw that the African traveller, Sidney Ormond, was to be received by the Mayor and Corporation of a Midland town, and presented with the freedom of the city. The traveller was to lecture on his exploits in the town so honouring him, that day week. Ormond put down the paper with a sigh, and turned his thoughts to the girl from whom he had so lately parted. A true sweetheart is a pleasanter subject for meditation than a false friend. Mary also saw the announcement in the paper, and anger tightened her lips and brought additional colour to her cheeks. Seeing how averse her lover was to taking any action against his former friend, she had ceased to urge him, but she had quietly made up her own mind to be herself the goddess of the machine. On the night the bogus African traveller was to lecture in the Midland town, Mary Radford was a unit in the very large audience that greeted him. When he came on the platform she was so amazed at his personal appearance that she cried out, but fortunately her exclamation was lost in the applause that greeted the lecturer. The man was the exact duplicate of her betrothed. She listened to the lecture in a daze; it seemed to her that even the tones of the lecturer's voice were those of her lover. She paid little heed to the matter of his discourse, but allowed her mind to dwell more on the coming interview, wondering what excuses the fraudulent traveller would make for his perfidy. When the lecture was over, and the usual vote of thanks had been tendered and accepted, Mary Radford still sat there while the rest of the audience slowly filtered out of the large hall. She rose at last, nerving herself for the coming meeting, and went to the side door, where she told the man on duty that she wished to see the lecturer. The man said that it was impossible for Mr. Ormond to see any one at that moment; there was to be a big supper; he was to meet the Mayor and Corporation; and so the lecturer had said he could see no one. "Will you take a note to him if I write it?" asked the girl. "I will send it in to him; but it's no use, he won't see you. He refused to see even the reporters," said the door-keeper, as if that were final, and a man who would deny himself to the reporters would not admit Royalty itself. Mary wrote on a slip of paper the words, "The affianced wife of the real Sidney Ormond would like to see you for a few moments," and this brief note was taken in to the lecturer. The door-keeper's faith in the constancy of public men was rudely shaken a few minutes later, when the messenger returned with orders that the lady was to be admitted at once. When Mary entered the green-room of the lecture hall she saw the double of her lover standing near the fire, her note in his hand and a look of incredulity on his face. The girl barely entered the room, and, closing the door, stood with her back against it. He was the first to speak. "I thought Sidney had told me everything; I never knew he was acquainted with a young lady, much less engaged to her." "You admit, then, that you are not the true Sidney Ormond?" "I admit it to you, of course, if you were to have been his wife." "I am to be his wife, I hope." "But Sidney, poor fellow, is dead; dead in the wilds of Africa." "You will be shocked to learn that such is not the case, and that your imposture must come to an end. Perhaps you counted on his friendship for you, and thought that even if he did return he would not expose you. In that you were quite right, but you did not count on me. Sidney Ormond is at this moment in London, Mr. Spence." Jimmy Spence, paying no attention to the accusations of the girl, gave a war-whoop which had formerly been so effective in the second act of "Pocahontas," in which Jimmy had enacted the noble savage, and then he danced a jig that had done service in Colleen Bawn. While the amazed girl watched these antics, Jimmy suddenly swooped down upon her, caught her around the waist, and whirled her wildly around the room. Setting her down in a corner, Jimmy became himself again, and dabbed his heated brow with his handkerchief carefully, so as not to disturb the makeup. "Sidney in England again? That's too good news to be true. Say it again, my girl, I can hardly believe it. Why didn't he come with you? Is he ill?" "He has been very ill."
"Ah, that's it, poor fellow. I knew nothing else would have kept him. And then when he telegraphed to me at the old address, on landing, of course, there was no reply, because, you see, I had disappeared. But Sid wouldn't know anything about that, and so he must be wondering what has become of me. I'll have a great story to tell him when we meet; almost as good as his own African experiences. We'll go right up to London to-night, as soon as this confounded supper is over. And what is your name, my girl?" "And you're engaged to old Sid, eh? Well! well! well! well! This is great news. You mustn't mind my capers, Mary, my dear; you see, I'm the only friend Sid has, and I'm old enough to be your father. I look young now, but you wait till the paint comes off. Have you any money? I mean, to live on when you're married; because I know Sidney never had much." "I haven't very much either," said Mary, with a sigh. Jimmy jumped up and paced the room in great glee, laughing and slapping his thigh. "That's first rate," he cried. "Why, Mary, I've got over L20,000 in the bank saved up for you two. The book and lectures, you know. I don't believe Sid himself could have done as well, for he always was careless with money--he's often lent me the last penny he had, and never kept any account of it; and I never thought of paying it back, either, until he was gone, and then it worried me." The messenger put his head into the room, and said the Mayor and the Corporation were waiting. "Oh, hang the Mayor and the Corporation!" cried Jimmy; then, suddenly recollecting himself, he added, hastily, "No, don't do that. Just give them Jimmy--I mean Sidney--Ormond's compliments, and tell his Worship that I have just had some very important news from Africa, but will be with him directly." When the messenger was gone Jimmy continued in high feather. "What a time we shall have in London. We'll all three go to the old familiar theatre, yes, and by Jove, we'll pay for our seats; that will be a novelty. Then we will have supper where Sid and I used to eat. Sidney shall talk, and you and I will listen; then I shall talk, and you and Sid will listen. You see, my dear, I've been to Africa too. When I got Sidney's letter saying he was dying I just moped about and was of no use to anybody. Then I made up my mind what to do. Sid had died for fame, and it wasn't just he shouldn't get what he paid so dearly for. I gathered together what money I could and went to Africa, steerage. I found I couldn't do anything there about searching for Sid, so I resolved to be his understudy and bring fame to him, if it were possible. I sank my own identity and made up as Sidney Ormond, took his boxes and sailed for Southampton. I have been his understudy ever since, for, after all, I always had a hope he would come back some day, and then everything would be ready for him to take the principal, and let the old understudy go back to the boards again and resume competing with the reputation of Macready. If Sid hadn't come back in another year, I was going to take a lecturing trip in America, and when that was done, I intended to set out in great state for Africa, disappear into the forest as Sidney Ormond, wash the paint off and come out as Jimmy Spence. Then Sidney Ormond's fame would have been secure, for they would be always sending out relief expeditions after him and not finding him, while I would be growing old on the boards and bragging what a great man my friend, Sidney Ormond, was." There were tears in the girl's eyes as she rose and took Jimmy's hand. "No man has ever been so true a friend to his friend as you have been," she said. "Oh, bless you, yes," cried Jimmy, jauntily. "Sid would have done the same for me. But he is luckier in having you than in having his friend, although I don't deny I've been a good friend to him. Yes, my dear, he is lucky in having a plucky girl like you. I missed that somehow when I was young, having my head full of Macready nonsense, and I missed being a Macready too. I've always been a sort of understudy, so you see the part comes easy to me. Now I must be off to that confounded Mayor and Corporation, I had almost forgotten them, but I must keep up the character for Sidney's sake. But this is the last act, my dear. To- morrow I'll turn over the part of explorer to the real actor ... to the star." Add The Understudy to your own personal library.